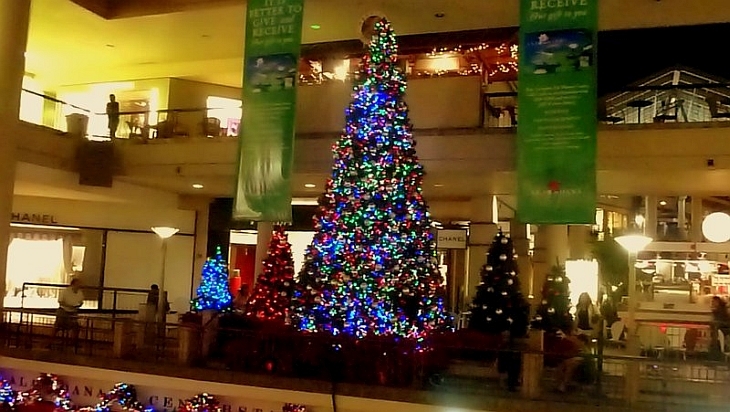 Celebrating Christmas in Hawaii at the Ala Moana Shopping Center in Honolulu. Many think of Hawaii as a place to kick off spring break or summer vacation. In winter, while some look to cuddle by a roaring fire, others want to be far away from the cold. Hawaii offer a respite from the chill, making it a sought-after place to celebrate Christmas. Despite the expense, many still see the advantages of visiting the Aloha State during the holidays. Here are just some of the top reasons why you should considering spending Christmas in Hawaii. December can be a challenging month. It’s a stressful time for many striving to meet their goals and deadlines before the year’s end. But even spending time with relatives can be something you might not always want to do. Running off to the islands might be a perfect way to avoid freezing temperatures, negative feelings and work pressures. In Hawaii, the sunshine will melt all the worries away. While prices can sometimes be high, some travel companies offer package deals during the holiday season. Visiting Hawaii is an unparalleled experience, whatever time of the year it happens to be. While still a part of America, its distinctive culture, landscapes and history make it a fascinating place. Christmas is an especially exciting time to be in the Aloha Sate. In Hawaii, Santa doesn’t ride in a sleigh with reindeer, he paddles to the shore in an outrigger canoe. Not only that, all the traditional holiday festivities come with a Hawaiian twist. These include luaus, hula dancing and kalua pig instead of Christmas turkey and ham. Instead of gifts that may collect dust someday, you can give your family memories they’ll never forget. Buy your husband a helicopter tour of Kauai. Take your kids to see active lava flowing on the Big Island. Buy your sister surfing lessons at Waikiki Beach. Or go for a mother-daughter date and get a Hawaiian lomilomi massage. If being in Hawaii is the gift itself, just lounge on the beach and let the good times roll. The winter months bring some of Hawaii’s most powerful waves. As a result, the months of November through February is one of the busiest seasons for the sport of surfing. The Vans Triple Crown of Surfing event occurs throughout the Christmas season. This makes the North Shore the place to go to watch the world’s greatest surfing champions battle mighty waves. Even at the hotels, your children have a greater likelihood of making friends their age at the pool. This is because since many are more likely to bring their children during the holidays. Not only do many hotels offer Christmas events, fun can be found even on city streets during Christmas in Hawaii. There are Christmas parades on every island. You can also attend holiday craft-making fairs where you and your kids can make Hawaiian ornaments. There are even Christmas caroling events, free musical shows and performances. Even if it means missing out on Christmas at home, celebrating the holidays island-style might become your new tradition. Because of the holiday season, travel prices will be higher. It’s wise to talk with a travel agent who would have access to the best deals available. At Panda Travel ® our friendly representatives can help you plan your ideal Hawaii trip during Christmas.